A pair of Disney Channel standouts lead off the Blu-ray and DVD release slate this week, proving the transition from tween fame to mega stardom isn't a Mickey Mouse affair. Not to be forgotten is a geek who has to fight for the one he loves. Charlie St. Cloud casts Zac Efron of High School Musical fame as a sailing whiz who withdraws from society after the death of his younger brother, Sam (Charlie Tahan). Charlie (Efron) mourns by keeping his promise to his late brother. He visits their favorite part of the woods at the same time each afternoon, baseball glove in hand. And, wouldn't you know, Sam shows up from beyond the grave every day to shag flies. The film, adapted from Ben Sherwood's novel, The Death and Life of Charlie St. Cloud, uncomfortably straddles the line between gooey teen drama and the supernatural. The film doesn't satisfy either genre, despite Efron‘s appealing presence. And the film's romantic subplot is so paint by numbers you can see the brush strokes on screen. Efron's leading man transition remains a work in progress. He's convincing as the loving brother and Type A student who demands perfection from himself and others. But whenever he's asked to deliver darker emotions, he mostly comes up blank. The actor's limited gifts aren't the film's only flaws. The supporting actors aren't given enough screen time to matter, from Kim Basinger playing Charlie's mom to Ray Liotta's turn as a paramedic with a cause. The Blu-ray extras include deleted scenes, a commentary track by director Burr Steers and three featurettes. "The In-Between World" lets a series of psychics ruminate on life after death, but it also includes a bona fide skeptic for some refreshing balance. Ramona and Beezus casts Wizards of Waverly Place star Selena Gomez as the older sister in Beverly Cleary's beloved series of young adult novels. The main attraction here is Ramona (Joey King), the nine-year-old with the overactive imagination. Ramona gets into all sorts of high jinks, but they're never forced or filled with consequences that might not happen in real life. It's that realistic approach that makes this a fine feature for the younger set, but the stiff acting and pedestrian direction by Elizabeth Allen will leave everyone else exasperated. The film's aggressively low-grade special effects work in the film's favor, but it's not enough to elevate it over anything you'll find on your cable TV dial. Give credit to Ginner Goodwin and Josh Duhamel who make the most of their supporting roles. The DVD extras include a tepid gag reel worthy of the film's G rating, some deleted scenes and a chat with Cleary herself. Hearing the aged author reminisce about the roots of her tween saga, and watching the actors share their affection for the timeless stories, is almost worth enduring the low-grade feature. Scott Pilgrim vs. the World already fulfilled the first contractual obligation of a cult movie - it flopped during its theatrical run. But the film's Blu-ray release should help it cement a place in movie lore - at least with the current generation of young movie goers. Michael Cera plays Scott, a nerdy bassist of a garage band who falls for the beguiling Ramona (Mary Elizabeth Winstead). But the object of his affections has a string of nasty exes. So it's up to Scott to beat back the barrage of beaus—and one beauty—to win her heart. 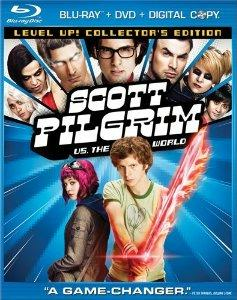 Scott Pilgrim may be the most authentic video game movie to date, even though the source material is Bryan Lee O'Malley's popular graphic novel. The sights, sounds and aesthetics all feel like an Xbox game, with characters careening around the set and no one ever really getting hurt in the process. Director Edgar Wright (Shaun of the Dead) infects the film with so much wit and style that he pays no mind to plot, narrative coherence and character development. The Blu-ray extras are as copious as one might expect. We‘re treated to three "making of" docs, alternate edits to the film, four music videos and a peek at the pre-production process right down to hair and makeup tests. The biggest bonus might be a censored version of the film safe for broadcast television, a novel offering that could attract a second tier of Pilgrim cultists some day soon.